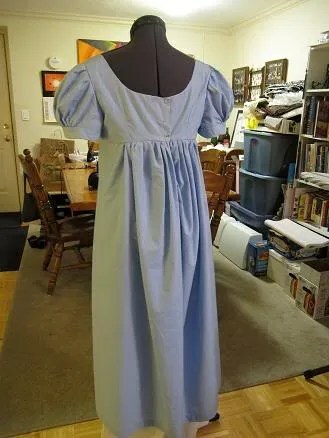 I’ve been trying to convince some of my college friends who still live around here to get into costuming. Both of the targets already know how to sew, and I’ve been working on them to come to an event. I’ve convinced both of them to try to attend the Gore Place regency picnic, but neither has time to sew a new outfit right now. In order to help them out, I told them I’d lend them something from my closet. One of these friends, Erin, is really tall. Like 6 feet tall. So most of my stuff was going to look really short on her. 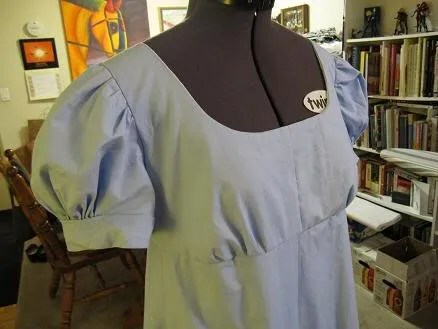 But then I remembered that I had a half-finished dress made from the Sense and Sensiblity pattern sitting in my tubs of fabric. I had accidentally cut it too long. 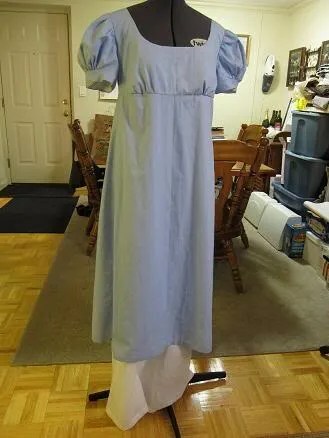 This was the second dress I had ever made, but I had taken it apart in order to fix some things, and never gotten around to finishing it. It’s a couple inches too long on me (I’m 5’8″), so it may be okay for her. So I hauled it out of my fabric tubs and finished it up yesterday. I gifted it to Erin last night. I think it might work for her. 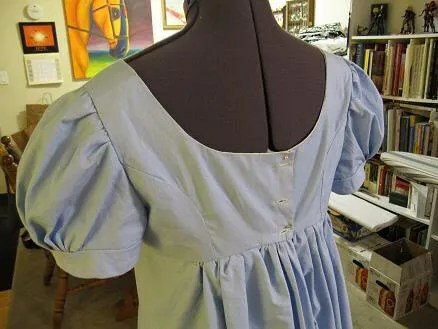 It’s certainly not accurate, but it gives the right look, and the blue cotton fabric will look good on her. Plus, it was kind of nice to finish it, even if it took me 3 years.